So if you’re going to be different, and I mean seriously different, you’ve got to pair foods that seem analogous and that make sense when you transfer ingredients. 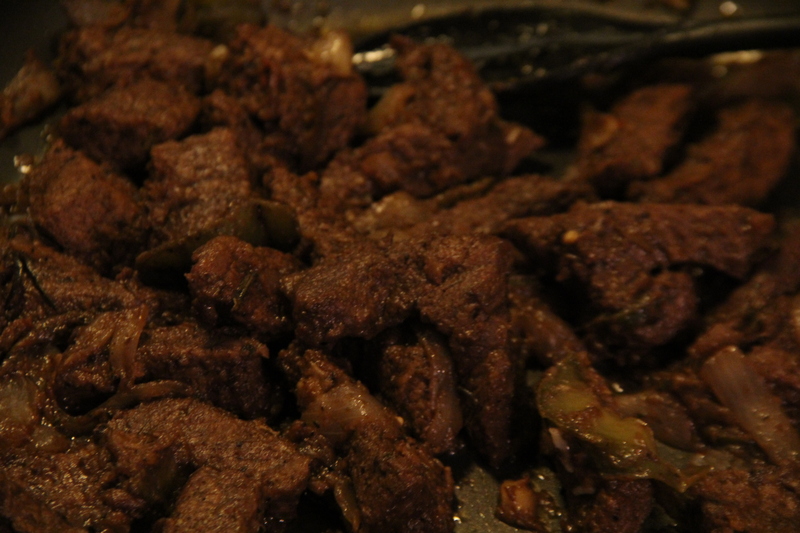 ጥብስ or tibs is one of my favorite Ethiopian dishes. Speaking of the Cooking Gene 🙂 (https://afroculinaria.com/2012/01/10/the-cooking-gene-project-frequently-asked-questions/) (Don’t forget our campaign launches February 1, 2012 on Indiegogo.com!) my Grandfather of blesssed memory worked for a time in Ethiopia. Tibs was a rare treat for him. Even though he liked the traditional Ethiopian dish of wot/wat or stew, he quickly became sick of it and longed for something more meat and potatoes. Tibs isn’t exactly meat and potatoes but its a beautiful use of red meat to absorb killer flavors. I first had it in a restaurant in Baltimore and ever since then it was one of the few Ethiopian classics that I really felt I could do well in my own kitchen. Speaking of Ethiopians–Ethiopia looms large in African American history. Few people know that African Americans helped Ethiopia fight against colonialism in her struggle to remain independent from the Italians. Ethiopia provided inspiration to the Ras Tafari movement in Jamaica and that spirit spread north to the United States. Ethiopian and Eritrean restaurants were some of the first African eating establishments to gain popular acceptance in North America–and in places as diverse as Washington D.C., Baltimore, Minneapolis, and New York–Ethiopian and Eritrean communities have created a loyal following from diners who love to sit down to baskets of injera (Ethiopian flatbread made from teff–an indigenous domesticated grain) covered in their favorite stews and delicacies from tibs to fit-fit to kitfo to wat to Ethiopian collard greens and other goodies. Contrary to what some divisive people might suggest-I will add I grew up with a lot of Ethiopian kids and they saw themselves as Black and part of a Black world. Nuff said, now let’s gorsha! When I was in Jerusalem in 2004 I finally made it to the Western Wall. It was one of the most thrilling things I have ever done in my life. It was like visiting G-d’s post office. I’ve seen so many miracles from when I put the prayers in the Wall…I can’t even begin to tell you. When I left my prayers—I retreated to wait for my group to signal to move on. There were five Ethiopian Jewish teenagers sitting there fighting over a cd Walkman. (Yes in 2004!) This community is a really sweet and intelligent community with a lot of struggles and successes in Israel. They have clubs catering to their youth where the walls are painted with Dr. Martin Luther King, Jr. , Malcolm X and Marcus Garvey. The Ethiopian people look up to us and our leaders as we look to their history and figures for inspiration like King Menelik of old. The boys saw me and stopped arguing. To this day that was one of the greatest moments of my life. You know the word Shalom doesn’t just mean “hello/goodbye/peace”….it comes from the word, shalem–“which means to be whole.” When you wish somebody shalom you’re wishing them wholeness. And given my very complex identity–whose isn’t really?—-I felt more whole than I had in years. Why bison? I love bison. My Dad got me hooked on bison and its a treat I can only enjoy once in a while. I thought it would add an American terroir quality to this ancient Ethiopian dish. Beyond berbere, the classic Ethiopian seasoning–which has as many versions as there are people to make it—this dish is already global since American chilies and peppers go into it. I suggest you enjoy this with plenty cold water available. You can buy berbere at Ethiopian markets or at some spice stores where its pre-made. To play with this dish further try heirloom and specialty produce. For example–I happened to have some Bullnose Bell Pepper around–frozen…..and I could have used Walla Walla onions or Vidalias but I chose a more “traditional” red onion. I used a dried fish pepper from Denzel Mitchell (I didn’t grow any this year.) for my red pepper component. Play with the ingredients to reflect what you have at hand and available to you or flavors that make the fusion more exciting. After all, that’s exactly how Africans in America made their cuisine happen in the first place! When I was growing up we always had a well stocked spice cabinet. My grandmother, mother and uncles did cooking from all over the world. Nowadays its easier to get bulk spices or spices from ethnic markets that are authentic, fresh and a little cheaper than a certain spice company….I go straight to the source—African, Asian, and Latin markets and to World Market and Penzey’s. Sometimes the local supermarkets will have a great deal on spices (Thanksgiving to Christmas is a great time for sweet spices) or have cheaper spices that you might use in a mixture rather than when you rely on a spice by itself. Warning–if you have a minimalist recipe–the quality and freshness of the spices you use tends to matter more than when you are making mixtures where the spice symphony comes into play. If you’re doing African and Caribbean cooking at home–its best to invest in spices that you will use in 6-12 months and buy them in considerable amounts. Off the top of my head, cardamom, allspice, cumin, cloves, cinnamon, paprika, ginger, garam masala, curry powder, fenugreek and tumeric and even onion and garlic powder are pretty crucial. So make the investment and cook away. Buy a mortar and pestle. Grind your own spices when and where you can and make it fresh. Stock your herb garden with thyme, oregano, Eritrean basil, African hot chilies, flat-leaf parsley, cilantro, tarragon and rosemary. Combine all ingredients, store in something airtight and store in a cool, dry place. In a large frying pan, gently heat the oil, then add the bison and onion and saute until the onions are translucent and softened and the bison meat is brown. Add the garlic and ginger and cook two minutes on a medium heat. Add the berbere and the green pepper and place in the pan a small sprig of rosemary and a pinch of kosher salt and coarse black pepper. Add the water and cook for about ten minutes or until the water has gently reduced, giving you a rich sauce to enjoy with the injera, tortillas or rice you have at hand with the tibs. Be sure to have a nice green salad, greens, legumes, etc, to get that red meat down!